The Life of Ted! : "A Million Letters"
Not many people know this, but Santa is contractually obligated to read every letter that is sent to him. That's the genius of Ted's evil plan. 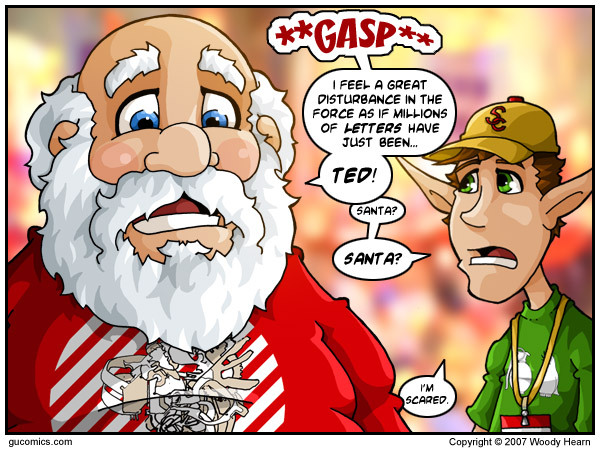 He's basically sending the message (pun unintended) that Santa will either send him a PS3... or he'll risk running late while he's forced to read all of Ted's letters. You know Claus is a good guy. And he's been through a lot over the centuries. But, I just don't know if he's ever encountered a being quite like Ted who, when it comes to receiving free crap, is uniquely motivated. I haven't decided what his true reason for wanting a PS3 is. I'm almost certain it has nothing to do with gaming. Lack of exclusivity on most titles means he could just get the games for the 360 he already owns. Honestly... I'd rather have the "to minifig scale" Lego Millennium Falcon. But, that's just me. I may start threatening Santa myself here soon. Or Lego. Or Lego Santa. Today's Pimpage: Santa is wearing a "Presstube Tees" shirt and the Elf is wearing a "Peace and Hate" shirt both from Threadless.Com.